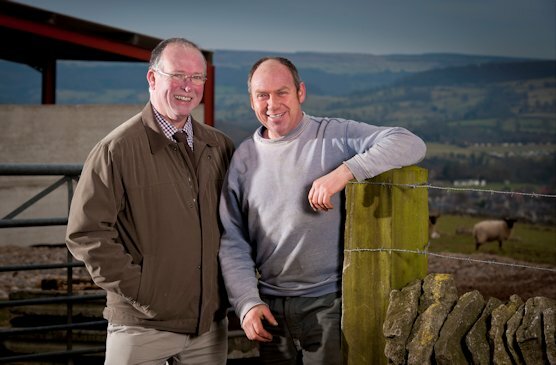 Farmers Weekly/Harper Adams Beef Focus farmer Simon Frost at Hopping Farm in the Derbyshire dales manages a herd 130 Spring calving Limousin x Holstein-Friesian cows that are put to high index Charolais bulls. Simon focusses on using bulls which are easy calving with below average birth weights and have high growth rates and eye muscle area EBVs. These types of bulls are termed ‘curve benders’ and can be found in all breeds. Simon’s calves are weaned in October and intensively finished on a 16% CP home mix and ad lib big bale silage. The home mix which consists of rolled barley, oats, hipro soya, linseed and minerals is initially fed at 1.5kg per day. By 4 weeks the home mix is increased to 4kg, with 6kg by 6 weeks then 8kg by week 8 and remains at this level through to slaughter. On arrival the calves are offered top quality 1st cut grass silage but by week 8 is replaced by mature 2nd cut silage with higher fibre to complement the high home mix feed rate. The following is an analysis of the performance of bull calves born in 2011 sired by 3 different bulls used in the herd in 2010. Table 1. Bull calf performance by sire at Hopping Farm. Shown in table 2 are the EBVs and Terminal Indexes for Littlebovey Altra, Balthayock Clifford and Swalesmoor Duke compared the breed average for 2011 born bull calves. Table 2. Charolais sire EBVs and Terminal Indexes at Hopping Farm compared to the breed average. The calving ease scores and birth weight results mirror the EBVs for the bulls with Clifford who has a negative Calving Ease Direct and heaviest Birth Weight EBVs resulting in the highest incidence of calving difficulty and the heaviest calf birth weights. The carcase weights also mirror the bulls EBVs with Clifford who has the highest 400 day weight EBV recording the heaviest carcase weight. This will also be influenced by Clifford having the lowest Fat Depth EBV allowing his bull calves to achieve heavier carcasses at similar/lower fat scores to the other two bulls. Daily carcase gains of 0.99-1.01kg were recorded by the calves from birth to slaughter for the three bulls. The bull calves from Altra recorded the highest overall carcase conformation score with 44% E and 56% U grades. Unfortunately there is not an EBV for Eye Muscle Area and Fat Depth for Altra. Pedigree breeders must be encouraged to scan cattle to identify bulls whose progeny will grade well, especially heifers that can be taken to heavier weights without getting ‘over fat’ on intensive systems. Progeny from bulls that have a positive (or low negative) Fat Depth EBV will finish easier off forage based diets. The main herd sires in 2013 include Maerdy Grubby, Vexour Freddy and Balthayock Elector which have superior EBVs than the bulls used in 2010-11 and so ‘hopes are high’ for further improvement in performance and a target daily carcase gain of 1.02kg from birth to slaughter. When Clifford was purchased his Calving Ease Direct EBV was +0.5 with a Birth Weight of +3.1kg. With increased accuracy these have changed to -4.5 and + 3.5kg respectively. Simon Frost would agree with these new (worse) figures as most of Clifford’s calves need to be assisted at birth. Clifford is therefore not a true ‘curve bender’ bull and will not be used on many cows this year. He will be a ‘back-up’ in case of any problems with any of the main stock bulls. It always pays if possible to have a ‘bull in reserve’ in case of bull fertility or health problems. The last thing you want to do is to find a replacement bull in an emergency of unknown health and breeding quality. This evaluation confirms again that EBVs work – have faith in them!